The fastest way to take your World of Warcraft character from level one to 85 is dungeon leveling, but the problem is that many of the current leveling guides just don’t support this new method of leveling. 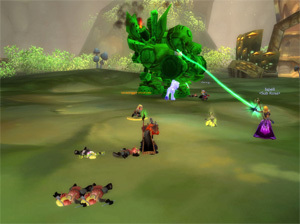 Dungeon leveling is now widely popular as more and more WoW players discover just how fast they can level their toons. Here’s a quick dungeon guide to get you started. Dungeon leveling basically involves running dungeons to get the experience you need to level. In some cases, you’ll level so quickly that you will gain one or two levels in just one instance run. Dungeon leveling came about as a result of the dungeon finder, which was added with patch 3.3 in the Wrath of the Lich King expansion. The dungeon finder allows players from all the servers in one server group to unite together and run an instance. It makes it possible for players to find groups to run instances back-to-back, no matter what time of the day it is. One of the most important things to remember about dungeon leveling is that your role in the party does matter. Tanks and healers will have little to no wait time in between dungeons, but DPS classes may have to wait as long as 40 minutes in some cases. It all just depends on how many people within your server group are queuing for dungeons within your current level range. Of course the short wait time for healers and tanks may pressure some players to queue as a healer or tank just so they don’t have to wait, but it is very impolite to choose these roles if you don’t understand them. Make sure you know what being a tank or healer requires before you decide to try to queue as one. Other than the speedy leveling benefits, there are also other reasons dungeon leveling has caught on so quickly. Overall, you will earn more gold while dungeon leveling. Additionally, you will have more access to better loot. The loot that drops from the bosses in the dungeons is far superior to anything you’ll find while out solo questing. Don’t Forget the Dungeon Quests! You’ll also be able to complete the dungeon quests while you’re dungeon leveling. Dungeon quests are usually available in towns that are nearby the entrance to the dungeon. They must be completed while inside the dungeon, which means you’ll not only be soaking up experience from all the kills you make inside the dungeon, but you’ll also get to collect a massive amount of additional experience when you turn in the dungeon quests later. And if you didn’t win the rolls on the exceptional gear that dropped while you were inside the dungeon, you’ll be happy to know that the gear you earn as a reward for completing the dungeon quests is also better than anything you’ll earn from a solo quest.